Then there were two, Ben Higgins had to choose JoJo or Lauren and that decision was not easy. This decision always seems more difficult when the lead's parents tend to favor one over the other. Lauren got the first parent date, which is usually a benefit. This was the first time Lauren and Ben's relationship seemed different. Ben's parents seemed to like Lauren, but there just was not that instant connection that we often see on the show. However, this could have had to do with that Lauren is so reserved and quiet. Most importantly, she was able to convey her feelings to Ben's parents. JoJo is outgoing and has a large presence. This type of personality thrives on "The Bachelor" and meeting the parents was no different. JoJo is raw and emotional and people can relate to her feelings. In doing this, Ben's parents were able to truly understand how JoJo was feeling. Ben and JoJo had strong body language and appeared happy. It was hard to imagine that he may not choose JoJo, but I had said all along she should be "The Bachelorette," if she did not win. Lauren has been reserved the entire show to avoid getting hurt. On this last date, it shows that the fear only gets worse when the contestants realize that the process is almost over. Ben and Lauren are still different than they were, but it appears to just be nerves. For the viewers it is difficult to watch the awkwardness, because it is not expected to see weirdness with the early front-runner. Lauren and Ben did not walk away with weirdness though, the couple said "I love you" again. There was one difference viewers typically see and that was the lack of gifts on this last episode. JoJo shows up to the final date is this neon yellow bikini and this accurately depicts her bold and fierce attitude. The date starts out fun and casual by swinging into a waterfall and sharing "I love you" again. However, the date goes from fun to serious quickly later in the night when JoJo needs reassurance about the relationship. Throughout the process, JoJo was hesitant to fall for Ben because of her past relationships, but she still gave it her all. In one of the most dramatic moments on this show, JoJo and Ben are setting on a bathroom floor. While JoJo is trying to get reassurance and validation about their relationship, Ben tries to help by saying that he loves her. As if saying "I love you" was banned, Ben even admitted to JoJo that he loved the other woman too. Ben appeared to still be conflicted and the rings bought him clarity. 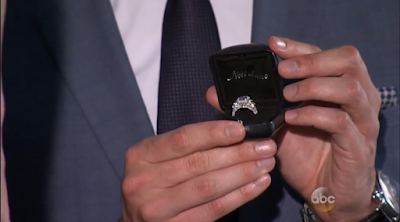 I do not think that his decision came down to a ring, but I do believe this was one of the closest choices in "The Bachelor" history. JoJo shows up first and viewers know what that means, she is going home. JoJo starts sharing her feelings and all I can think is "stop her." 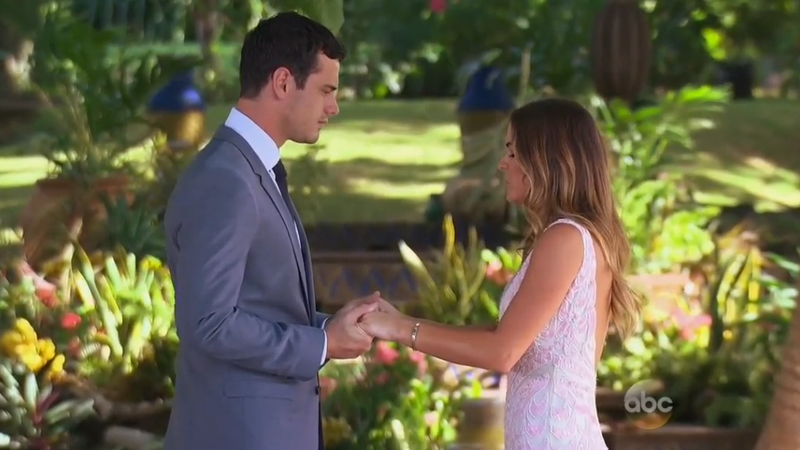 On "The Bachelor," the women do have one advantage over male contestants on "The Bachelorette" and that is they that do not have the role of the proposal. There is nothing worse than on the show when people propose and the lead has to pick them up off of the ground. Ben finally stops JoJo and she is shocked. In true JoJo fashion, she reassures Ben that it is OK, remains classy and walks away calmly. She kept it together until she got in the limo and she is even a pretty cryer. Congrats Ben and Lauren are engaged! Before the proposal, Ben's tone was low and sullen. At one point, it looked like Lauren thought he was breaking up with her, but then he got down on one knee and proposed with the largest ring in "The Bachelor" history. Join me on Twitter @BachelorExpert to live tweet the show. Were you happy Lauren won? Happy that you had a wonderful experience in this bachelor show which you attended first time. I had attended first bachelor party at age of 20 at one of venues in Houston. I can never forget this party and it always will be special for me.